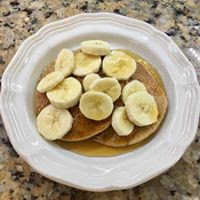 I am well-known in my extended family for making light and fluffy whole wheat pancakes using this recipe, so my standards were extremely high when I adopted a mostly vegan diet and went searching for a pancake recipe that didn't use eggs, milk, or oil. After testing multiple ideas and options, I've finally come up with a combination I love. 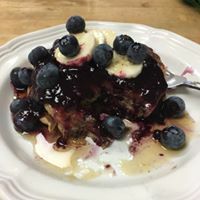 These pancakes are light and satisfying using all whole food, plant-based ingredients and the only sugar is what you add on top, which is fruit and pure maple syrup for me or maybe a berry sauce. Before I get started mixing, I take the maple syrup out of the refrigerator and place it in a deep bowl of hot water to take the chill off. 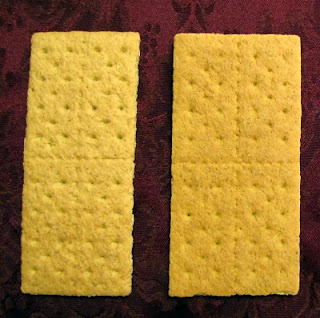 I don't like to warm it up on the stove or in the microwave because it gets too thin and runny. First, make "soured" milk by placing the lemon juice or vinegar in a glass measuring cup and adding non-dairy milk to the 1 1/2 cup line; set aside for 10 minutes. If using a flax "egg" instead of aquafaba*, add the ground flaxseed to the warm water and stir well; set aside to form a gel. Begin heating a non-stick griddle or large frying pan over medium heat. Stir the flour, baking powder, baking soda, and salt together in a large bowl to combine. When the milk has curdled, add in the flax "egg" or aquafaba* and the applesauce and whisk together. Pour this over the flour mixture and whisk gently, just until well-combined, with no dry spots. Do not overmix. Pour the batter by 1/3-cupfuls onto the hot griddle or pan. 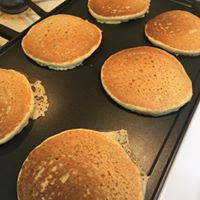 Cook until bubbles form all over the surface, then flip with a pancake turner and cook until the centers spring back when gently pressed with a finger. (Adjust heat as necessary so they don't burn before the centers are cooked.) Stack on a serving plate, lightly covered to keep them warm, while you cook the remaining batter. Serve hot, topped with fruit and/or sweetener of choice. *aquafaba is the liquid drained from a can of chickpeas. It makes an excellent egg substitute and really has no beany flavor. Who knew? Google it for more ideas on using it. I always freeze the liquid whenever I use canned chickpeas so I'll have a ready supply. You can use just about any juice and fruit combination in this recipe. Stir the cornstarch into the juice in a medium saucepan. Add the sweetener and bring to a boil. Boil for 1 minute, then add the berries and lemon juice. Return to a boil, reduce heat, and simmer 5 - 10 minutes until berries are soft and juices have thickened. A good non-stick griddle is an excellent investment. There really are pancakes hidden under all that fruit! A perfectly satisfying, healthy breakfast.